Adorn yourself and your partner with a constant reminder of the surrender and commitment within your relationship. The attractive and subtle design of this petite, feminine cuff and dog-tag style key necklace set make them perfect to wear in public as an everyday accessory that symbolizes your Ds power dynamic. Scratch resistant and nickel-free tungsten steel forms a small, rhinestone adorned cuff with a chrome lock built into the clasp, an accessory that can only be removed by their Master or Mistress. 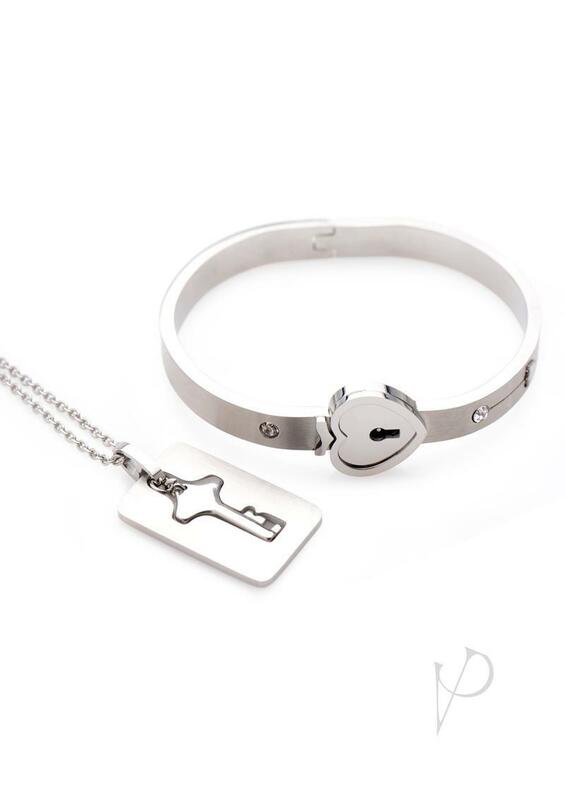 The key sits within the cut out of a tungsten steel tag, which hangs from a chain for you to wear upon your chest, reminding you of the pride and responsibility that comes with ownership. This beautiful set allows you to comfortably put your bond on display. Necklace chain length: 19 in.